Discover Huaraz and the snowy peaks of the Cordillera Blanca, the premier hiking and climbing destination not only in Peru, but in all of South America. A growing city approaching 100,000 inhabitants, bustling Huaraz is the capital of Ancash Department and the major town of the Callejón de Huaylas. More importantly, Huaraz is the premier hiking and climbing destination not only in Peru, but in all of South America. Looking out of a hotel window in this highland city, it is easy to see why. An amazing spread of snowcapped mountains dominates the view, rising as high as Huascaran (6,768 m / 22,206 ft), Peru’s highest peak and the highest mountain anywhere in the Tropics. It dominates the Cordillera Blanca, a 180 km (112 mile) long mountain range which is among the most beautiful and impressive in the entire Andean chain. Huascaran National Park, a UNESCO World Heritage Site, protects an extensive part of this range and is home to some 50 peaks soaring over 5,700 m (18,700 ft), and there are many more outside the park. 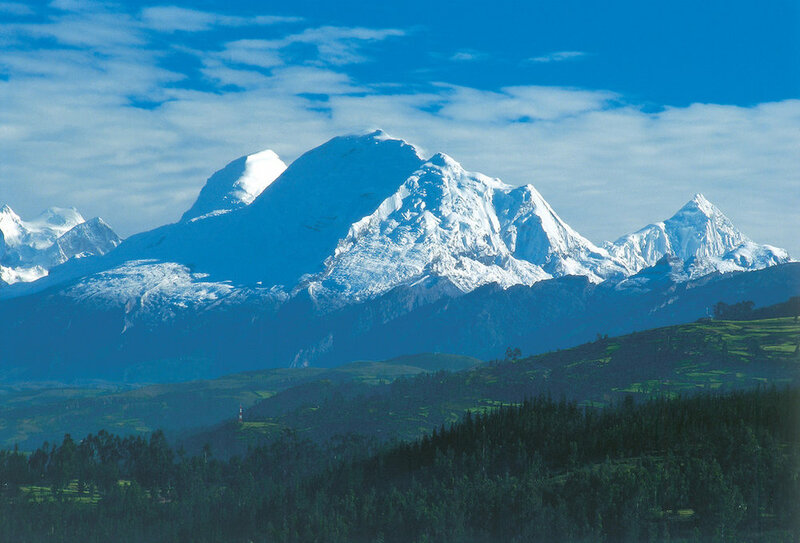 The awe-inspiring Huascaran Mountain, with its snow-capped peak, overlooking Huaraz. To put this in perspective, North America has just three mountains exceeding 5,700 m (18,700 ft) - one in each of Mexico, Canada, and the USA. After the Himalayas, the Huaraz region truly is the roof of the world. Hidden below the glaciated ramparts are dazzling turquoise, emerald, and jade-hued lakes, the haunts of highland birds such as Andean geese and puna ibis, and the destinations of trekkers who find spectacular campsites from which to admire the reflected mountains. The turquoise waters of Llanganuco Lake in the Cordillera Blanca. South of Huaraz is Peru’s second highest range, the Cordillera Huayhuash, a compact group of startlingly steep mountains huddled around Yerupajá 6,634 m (21,766 ft). This area offers world-class, high-altitude trekking. West of - and parallel to - the Cordillera Blanca is the lower Cordillera Negra, with Huaraz nestling in between, anchoring a string of small towns running along the Callejón de Huaylas, the local name for the Santa River Valley, which separates the two ranges. Suspension bridge across the fast-flowing Santa River being used by local farmers. The Cordillera Negra lacks snow-caps, but gives access to stupendous single-track mountain biking with great views of the Cordillera Blanca. There are countless biking opportunities - both guided and unguided - including descents to the coastal lowlands. There is a limited amount of horse riding. Peru has no ski areas, but diehard skiers carry their sticks onto glaciers when there is a skiing competition every May or June (dates vary). River rafting on the Santa River has been curtailed in recent years because of low water levels and pollution, but remains possible year-round with mainly Grade II runs. As anywhere in Peru, archaeology is not to be forgotten. Several sites from different cultures can be visited, the most fascinating of which is the 3,000-year-old, partly underground Chavín de Huantar, a two-hour drive from Huaraz on the east side of the Cordillera Blanca. 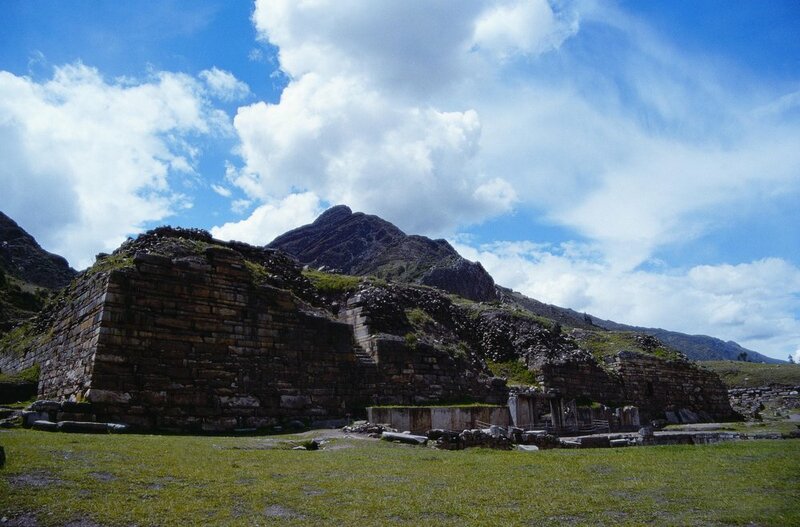 The Plaza Mayor at Chavin de Huantar archaeological site. Also along the east side is a string of rarely-visited villages, perched prettily between the Andes and the Amazon Basin and carrying on a traditional agricultural existence much as they have done for centuries. There is yet more world-class trekking to be had in this area, as this is where one of the main highways of the Qhapaq Ñan - the enormous network of Inca roads - passed on its way from Cusco to Quito. Plant life muscles its way into the litany of tallest and highest. Puya raimondii is the world’s largest bromeliad and boasts the tallest flower spike in the world. The plant can take more than a century to mature, but when it does – wow! An inflorescence topping 10 m (33 feet) in height bursts into the air, covered with 8,000 white flowers, and taking just a few weeks to mature. You can almost watch it growing. After flowering once, usually in May, the plant withers away and dies. Huascaran National Park is one of the best places to see these prodigious plants.